Back in the fall of 2015, I participated in the 2015 PR Sewing Bee. The last challenge was making an Olympic team uniform, and this was part of my submission. I thought it would be fun to blog it now that Portugal is playing in the EuroCup semi-finals today. I made the skirt, trousers and top as blogged in my previous post. 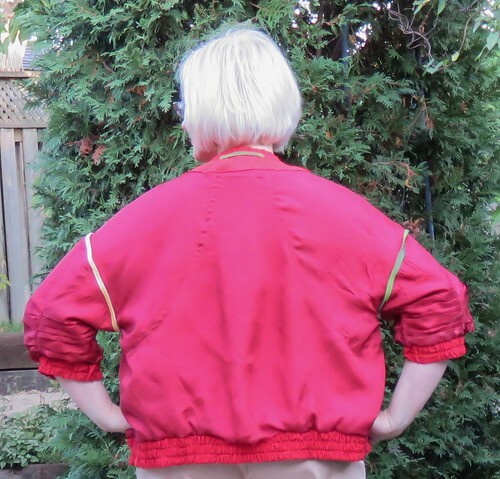 This is the first bomber jacket I’ve made, and I thought it would be fun to pull out all the red silk and linen scraps in my stash to make up this John Richmond bomber-style top from Burda September 2013. And it is not the most simple with a gazillion pieces, but it worked perfectly with all my little pieces of red. 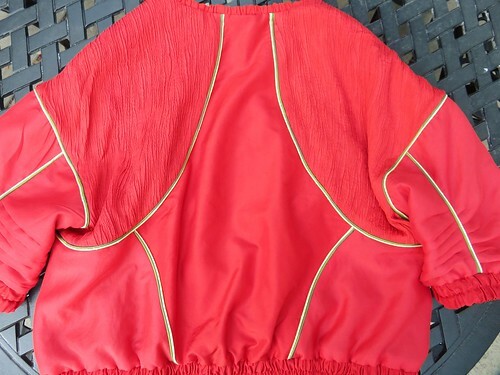 I used red linen from my jumpsuit for the front bands and collar; a cotton-silk voile for the lower jacket, upper front and sleeves; and a rayon plisse (a double-layered fabric where the pleated fabric is loosely attached to a flat back) for shoulder and side constrast sections. The centre back panel and elasticated sleeve and bottom bands are made from silk taffeta. Here’s the front. You can see the contrasting fabrics with the piping. The single welt pockets are silk taffeta, too. The sleeves have a pleating detail, which is just beautiful. I made the lining for the sleeves separately instead of pleating all layers together as one. I did a double row of piping around each section using gold and green silk shantung. Labourious, tedious, and quite satisfying, for sure, once it was done. 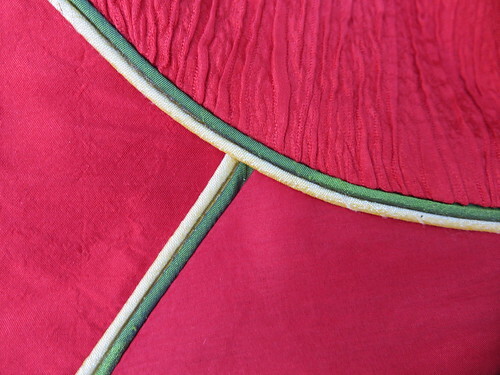 This is a close-up of the back shoulder (from L, clockwise: silk taffeta, rayon plisse, silk-cotton voile). I’m not a big bomber jacket fan, but this is so luxurious to wear, and doesn’t advertise it’s patriotism too loudly, which suits me. Back view, waving my flag. Here’s the interior. I fully lined the jacket. 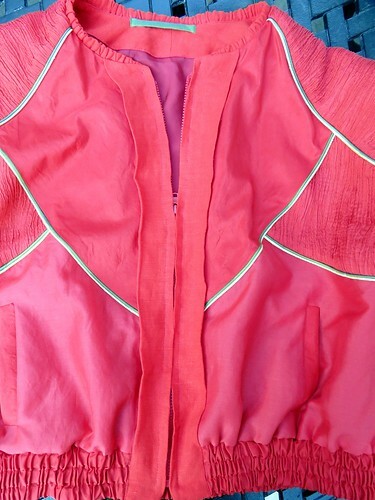 The body and sleeve linings were sewn as separate pieces. I put the sleeve lining/fashion fabrics together, added the sleeve elasticated cuffs, and then stitched the sleeves to the jacket body. The armscyes are bound with gold and green silk shantung. The facings are linen. 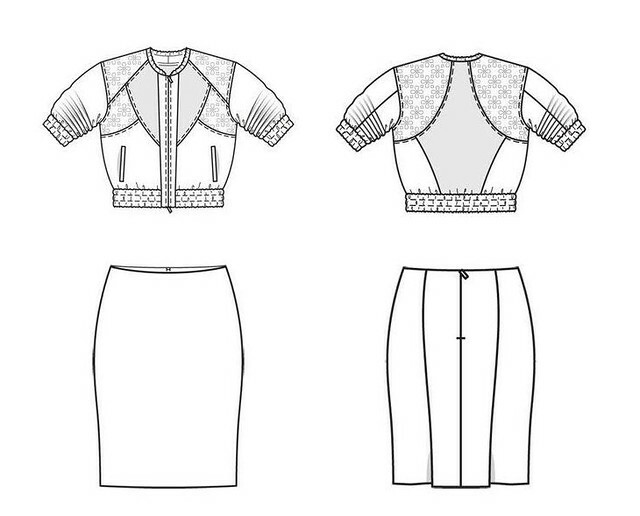 Wow what a design – with the pleats on the sleeves and the piping – beautiful work! I cannot believe that piping detail – WOW! What an amazing piece of art! It looks great on you!! That jacket is amazing! The piping is just gorgeous – how did you muster up the patience to do that much piping that is so fine?! Yes! They won this afternoon, which means they’ll face off on Sunday with either France or Germany. 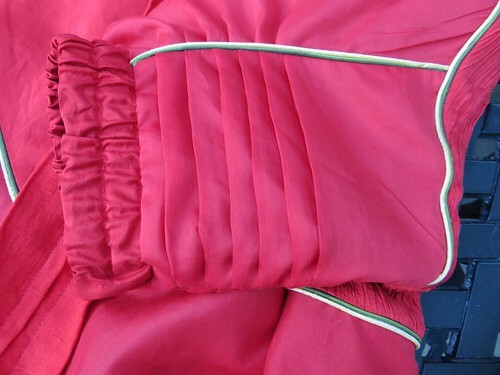 The piping was a welcome part of the jacket, because it made me sew slowly, which is the kind of sewing I like best. Exciting! Your jacket is going in for the big time finale. I’ll be cheering you on all the way! Thanks! And of course you need to support the home team! Between you and me, I’d be shockingly surprised if my team can play well enough to make it to Sunday, given personalities and club history…. Ack, that’s such a cool jacket! You made such great use of all the seams and design lines. Killer jacket with the best features and double piping…OMG…only a woman in love would go to all this trouble! Love love love the pleated sleeves and the great use of different fabrics many of which would be considered “after 5” (do they still use that term?) but work so well in this sporty jacket. Great job! Go Portugal! Amazing! I love the different fabrics, too. Incredible work! This looks so great, Tia. Very interesting use of different fabrics and some useful ideas to remember for another occasion. You look great! I am not a bomber jacket person either usually but I have wanted to make a short wool bomber for a while. Hope you have a need for a trip to Little Portugal (great area of the city) on July 10. Wonderful use of all those fabrics. 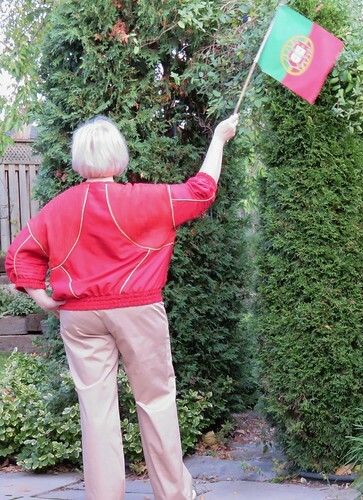 Our Portuguese family is also cheering!